Have you ever been 60 miles inland waiting for a hurricane? There is a ghostly calm that comes, as the clouds pile up, skies darken and the winds begin to build. You feel a charge in the air that goes right through your center. 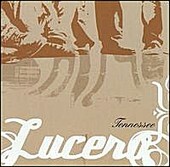 Lucero's sophomore release Tennessee is like one of those days if you woke up to find yourself at the painful end of loss and regret having smoked too many cigarettes the night before. If this is country it's the kind sung by outlaws that are running more from pain than the law, on a road that carries a person from one half-lit bar to the next. If this is rock, it's the good kind guitar driven that scoops flesh and bone out of the center of your chest. This band reminds me of I Can Lick Any S.O.B. in the House, early 7 Mary 3 and Ben Fold if he was trying to be heard from the bottom of a well. This collection of songs is haunting music built around the voice of Ben Nichols who belts it out like he's in pain. Nichols seems to tear the lyrics from somewhere between his gut and the middle of his chest, a place where the scars of broken hearts stiffen. It hurts to pull at that spot too much. I know, I tried. As an album, it rises and falls like a long familiar highway making it a great CD to throw in and enjoy the ride. Go get this one cause the winds starting to blow and your darn near out of cigarettes. Rating: B+.